Hidden Knowledge/Hidden Nonsense of an unknown poet/writer/loser/nerd. My friend <Patty >http://petitemagique.wordpress.com and >Tori< http://toriascribbles.wordpress.com nominated me for The Wonderful Team Member Award! Thank you Patty and Toria for this Honor! and I hope I never disappoint you guys! Thank you for following my blog and enjoying my poems! means a lot to me! 1. The Nominee of the Wonderful Team member Readership Award shall display the logo on his/her blog. 2. The Nominee shall nominate 14 readers they appreciate over a period of 7 days, all at once or little by little. 3. The Nominee shall name his/her Wonderful Team Member Readership Award nominees on a post or on posts during 7 days. Over a period of 7 days (1 week), the Nominee shall nominate a number of readers that he or she appreciates – this can be done at any rate during the week. It can be all on one day or a few on one day and a few on another day, as most convenient to the Nominee. The Nominee shall name his or her Wonderful Team Member Readership Award nominees on a post or on posts during the 7 day (1 week) period. Those are the last of the nominees! If you don’t want the award its o.k.! and you don’t have to do anything about it, but I just wanted you all to know all your blogs are regular reads in my week! My friend <Patty >http://petitemagique.wordpress.com nominated me for The Wonderful Team Member Award! Thank you Patty for this Honor and I hope I never disappoint you! You always have the most beautiful poems and ideas on your blog and I am glad I have a friend in Holland! Those are the nominees for today! If you don’t want the award its o.k.! and you don’t have to do anything about it, but I just wanted you all to know all your blogs are regular reads in my week! 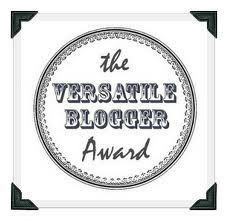 I Got Nominated for the Versatile Blogger Award!! I’m truly honored and grateful for all the wonderful feedback that I have gotten from Patty Shane and all my other followers! Thank you and I hope I never disappoint you all! Shane is “the old soul” that inspired me to write more poetry and I can’t imagine what I can offer to someone who is so caring enough to encourage shy quiet poets like me thank you Shane I hope one day you consider me a good friend! 1-Thank and link back to the person who awarded you. 3- State 7 things about yourself. johncoyote.wordpress.com for his beautiful poem Never again. Nie wieder. Plus jamais which moved me to tears. Thank you for that poem. http://moolta.wordpress.com/ for making everyday a challenge for me. http://culturemonk.com/ for butterfly wings let’s hope they cause good weather. http://shanesbookblog.com/ for reminding me of my first love Poe. http://childeofthenight.com/ for his incredible poetry. http://rantingchef.com/ because I love his recipes which are really good! http://simpletombornhigh.com/ for his simple yet deep shenanigans . http://frenzyofflies.wordpress.com/ for reminding me of my childhood. http://dmariedoucette.wordpress.com/ her poetry is so beautiful I feel that my chicken scratch is unworthy of her attention. http://thewritingcorpofficial.wordpress.com/ because they featured one of my poems which encouraged me to be brave and keep submitting. http://bottledworder.wordpress.com/ for her good advice on writing. http://wrestling-life.com/ because we all fight addiction but only the strong willed beat it. I hate haters. It’s just who I am and I hope people accept that I’m not going to wish love and peace on evil people. I’m a total clean freak. Don’t sneeze in your hand then ask to shake mine, thank you. I like baking but I’m afraid of ovens…. I’m that chick that fell for only one guy in her whole life and wouldn’t even look at another men. I love history, science, chemistry. Today my laptop resurrected and I went to check my emails and I had a bunch! (7)lol. But the point is not in how much mail I got its how important it is. 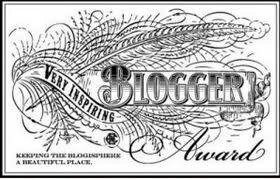 I was nominated for an Inspiring Blogger Award by Shanesbookblog thanks by the way! The way this award works is you tell people about it and you nominate 15 other bloggers.So more people know about it but these are better instructions so follow them! 1. Display the award logo on your blog (top). 3. State 7 things about yourself (below terms). 4. Nominate 15 other bloggers for this award and link to them (below 7 things). 5. Notify those bloggers of the nomination and the award’s requirements (will do). 7 things about me you didn’t know………. I love to read. whether it’s fiction/nonfiction/history/sci-fi/or just some crazy chick book that everyone’s talking about. I’m overbearing and I am extremely shy around new people. But once you get to know me you accept me for my flaws because I’m too nice to hurt anyway. I want to be either a psychologist or a history teacher depends on which comes first. I love poetry from all around the world,writing and reading it! and last but not least……….I have a crush on Sheldon Cooper. http://shanesbookblog.wordpress.com Shane for being awesome and inspiring me yet so humble. http://wrestling-life.com because she is courageous. http://poemsandpeople.wordpress.com because he writes beautiful poetry. http://helenvalentina.wordpress.com she told me I was good! http://nedhickson.wordpress.com/ he makes me laugh! and proves that men do stupid things. I hope I did this right! Cairo's coolest cosmopolitan hotel. General Manager: Youssef Rakha.